Copperfest in Oconto on June 7, 8, & 9 at Copperfest/American Legion Post 74 Park, 709 Madison Street. Want to be a vender in the Village Shops? E-mail: cc.by.design000@gmail.com or call 414-324-6193. 85% of products are homemade. Hours Friday 5pm-9pm, Saturday 10am-7pm, Sunday 10am-3pm. Vendor application link below. Entertainment: Maddog & Merrill, Otherwise Duke, Racing Pigs & Ducks, Brayson's Bouncers, Bubble Obstacles, UTL Wrestling, Horseshoe Tournament, Kids Activities, Car Show, Vendor Village and Food & Refreshments. Copperfest hours: Friday 5pm-11pm, Staturday 11am-11:30pm, Sunday 11am-5:30pm. Car Show: Saturday, June 8th 10am-4pm, Copperfest Grounds. Judged show with People's Choice, Children's Choice, Copperfest Committee Pick, Best of Show and more! Early registration is $5.00 include 1 free festival pass and ability to participate in parade. First 50 cars registered on day of festival receive Dash Plaques. Voting will end at 2pm and awards will be announved at 3:00pm. Click here for brochure! 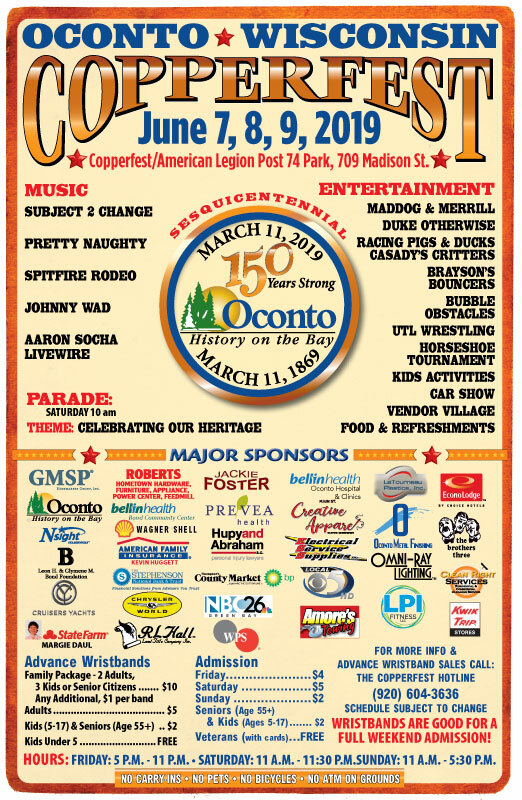 Oconto Truck Pulls Friday at Oconto City Docks, June 7 registration starts at 4:00pm-6:00pm, pulls start at 7pm sharp. Contact: Bill at 715-938-5486. Crivello's on Main and the Log Jam Saloon will be having a "block party" and street market on Saturday, June 8th starting after the parade. For more information call 920-834-5099. Live music at the Garage on Main Street on Saturday the 8th and Sunday the 9th. Moonlighters and, Sunny and the Heat, and FITR Band.